Installation of a new air conditioning system is a complex process that requires careful measurement of your existing cooling system and the amount of square footage that needs to be cooled, as well as the budget you have available for cooling over the course of the 10–15 years your new system will operate. 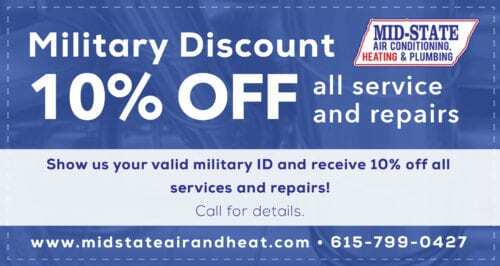 To learn more about air conditioning service and installation and replacement services in Nashville, TN, contact the experts of Mid–State Air Conditioning, Heating & Plumbing. Ask about HVAC financing, today! 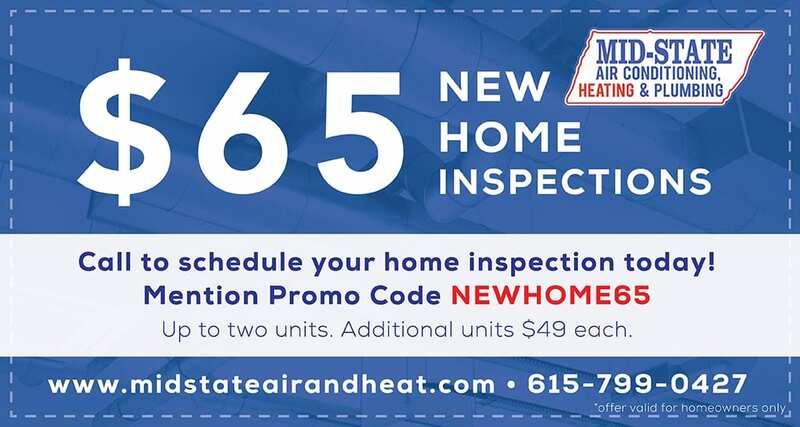 If you’ve decided it’s time to have a new air conditioning system installed in your Nashville home, please give us a call to learn more about the entire process. We will start by visiting your home and performing a thorough load calculation to determine the exact size and type of air conditioner that fits your cooling needs. During this measurement, we will inspect factors including your insulation, weather stripping, existing ventilation, ductwork and more. This will allow us to select the system that matches your exact size needs as well as your budget. After selecting a system that matches your specific needs, we will look for a system with the exact budget you have in mind. Your cooling budget must take into consideration not only installation cost, but ongoing operating costs. Higher efficiency systems cost more to install but generally cost significantly less to operate over time and will make up for the initial investment. If you have an existing air conditioning system and want to know more about the replacement process, we can help you learn about the many benefits of doing so. To start, a newer air conditioning system will likely have a much higher efficiency rating than your existing system. Even systems built just ten years ago have much lower efficiency ratings than top–of–the–line systems created today. Additionally, your existing system likely requires repairs and significantly more maintenance on an annual basis than a newer system would. Even if it generally operates as it should, you’ll likely need to have it inspected more often. A brand–new system will normally work quite well with only one annual maintenance visit, greatly reducing the cost of maintaining the system and ensuring it doesn’t require emergency repairs unexpectedly. 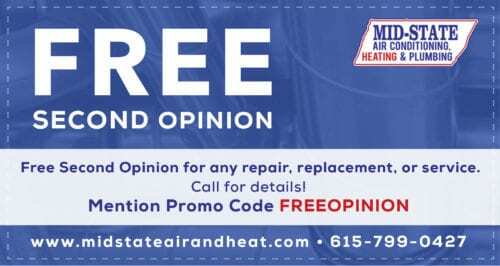 If you decide it is time to have a new air conditioning system installed in your Nashville home or if your existing system is no longer working properly, call the experts at Mid–State Air Conditioning, Heating & Plumbing. 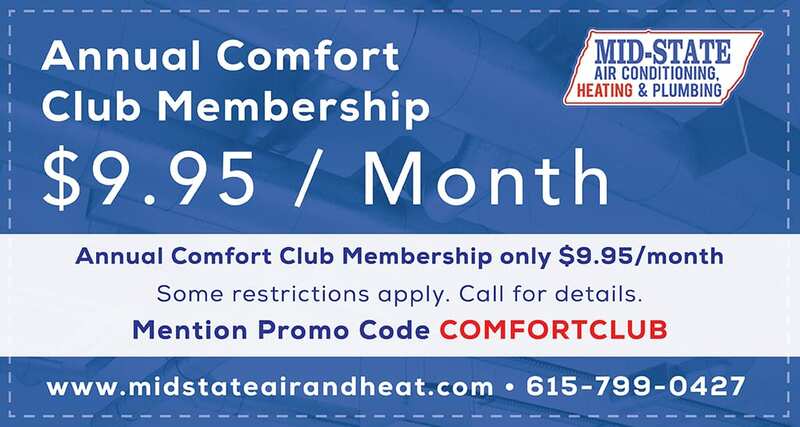 Our Nashville, TN air conditioning installation and replacement service specialists will work with you to choose and install the perfect system to serve you well for years to come.